Parents and commuters who live near schools all know that drop-off and pick-up times are terrible for causing traffic around those locations. But a new program will hopefully alleviate the congestion in front of La Mesa Arts Academy (LMAA) and, if successful, may lead to a smoother and speedier way for parents to get their children to and from all La Mesa-Spring Valley School District (LMSVSD) schools. The new program at LMAA will begin on Oct. 3, which is International Walk to School Day, and will divert the pick-up and drop-off zone for students from Junior High Drive to Olive Avenue, between University and Normal avenues. 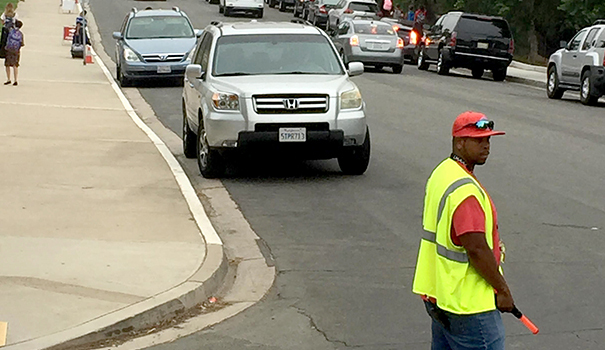 City employees in vests carrying stop signs will greet the dropped-off students at the drop-off location and once there is a group of around 10, one of the city employees with chaperone them as they walk to school. “It’s exactly 300 yards, three football fields, I measured it,” Arapostathis said. After school, the process will work in reverse and the students will be chaperoned in groups from LMAA to the same location on Olive [Drive] to be picked up. This new program is an expanded version of one that was tried out previously at another school. “When I was a teacher at Rolando, we beta tested this … we call it the ‘walking school bus,’” Arapostathis said, adding that the beta test at Rolando was once a week and that this program at LMAA will be every school day. Because of the beta test at Rolando, Arapostathis is sure the new program will work in alleviating the traffic around LMAA in the mornings and afternoons — but that isn’t the only benefit to the program. In addition to showing that the walking school bus program works to reduce traffic and drop-off and pick-up times, the Rolando beta test program also informed the new program where there could be improvements. “One of the problems we had when we beta tested it at Rolando was we had volunteers, and occasionally a volunteer wouldn’t show up. So this time, the city is going to invest,” Arapostathis said. Initially, the program will only be at LMAA “to see how it works,” but Arapostathis said he is working with LMSVSD superintendent David Feliciano to increase the program one school per year. “My goal is to get all 21 [LMSVSD] schools on board,” Arapostathis said. For LMSVSD schools outside the city of La Mesa, Arapostathis wants to work with County Supervisor Dianne Jacob to fund the schools in the county and with the city of El Cajon to fund Fletcher Hills. ATP-funded projects are meant to encourage using active modes of transportation like walking and biking and making sure that it is safe to do so. During the beta testing at Rolando, Arapostathis said safety was the main impediment to parents allowing their children to walk to school. “The biggest concern of parents, we met with them, wasn’t necessarily pedestrian safety, but they were afraid for their children that someone was going to take their children, some kind of abduction,” he said. The guided walks to school alleviate that concern, and the part-time employees that will carry out the program will all be hired through the La Mesa Police Department, Arapostathis said. “They’ll be LiveScanned, obviously, and background-checked because they’re going to be working with kids,” he said. People interested in one of the part-time positions should contact Misty Thompson through the city of La Mesa website, cityoflamesa.us. Thank you Mayor for trying some innovative approaches which not only can address traffic issues, but give kids more opportunity to get more exercise – which can help their overall health and improve their ability to learn.